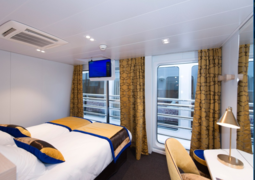 The MS Symphonie has 55 cabins, all of which are outside cabins and regardless of which one you choose you are guaranteed a comfortable journey. Aboard this ship you will find only the most beautiful accommodation which is coupled with modern amenities to give you the most relaxing cruise, while still being full of excitement and adventure as it sails through the best of Europe’s rivers. If you are a lover of International and French cuisine then you have much to look forward to on a cruise aboard this ship with its incredible food and good wine which is known for being both delicious and refined. Enjoy every meal of the day with a fantastic buffet containing meals made from only the freshest and highest quality ingredients. At the centre of the ship there is a lounge and bar where you can have a nice time with fellow travellers over a drink or two. Aboard the Symphonie you will have an unforgettable and wonderful river cruise experience chock full of adventure, comfort and discover. In the lounge you can relax with other passengers and watch the beautiful scenery that will pass you by outside. Upon the sun deck there is an incredible panoramic view and you can sit outside and enjoy the gentle breeze. At each port you have the chance to take part in an excursion to discover the most famous monuments and get to know the culture of the local region. Do not miss this opportunity to travel along the most beautiful rivers of Europe along with their corresponding cultures and landscapes. During the day time it is recommended that you wear more casual and comfortable attire, especially during the onshore excursions. However at the gala dinner, more formal wear is recommended. Please bear in mind that for health and safety reasons, each passenger must not exceed a luggage allowance of 20kg along with one piece of small hand luggage.